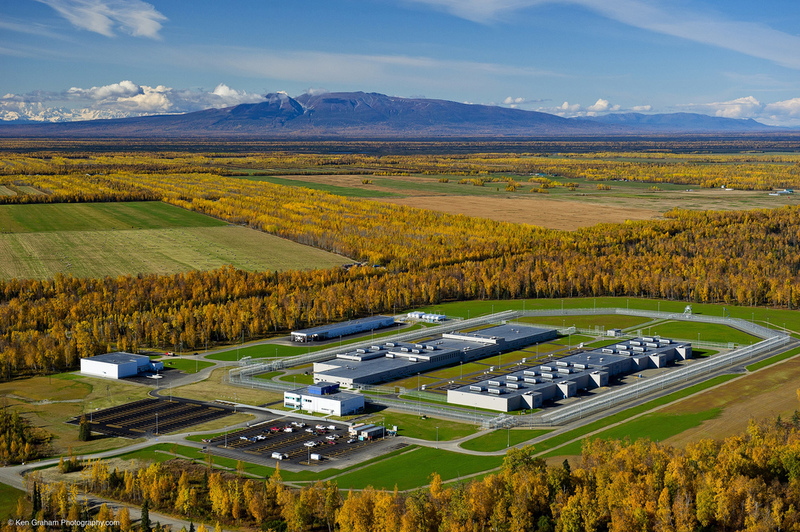 After a lengthy design-build completion, KPB Architects (Architects of Record), with design partners HOK and Durrant, and general contractor Neeser Construction, developed this 1,536-bed, 430,000 SF, $240 million medium security prison for the State of Alaska. The site is located on 88 acres surrounded by a vegetation buffer of spruce and birch trees. Designed in accordance with ADA accessibility guidelines, with the exception of a small percentage of areas that are for the exclusive use of physically fit staff, this correctional complex incorporates all functions necessary for a self-contained community including dormitory-style housing, administration, education, dining, security, medical, fitness and recreation. In addition, the overall design required a life-cycle cost analysis to prove the selection of construction assemblies and HVAC systems was accomplished to achieve optimum energy efficiencies. Central to the campus development is a 250 ft. x 1000 ft. movement yard flanked on one side by general housing and on the other by the support/visitation services facility. Basketball courts and softball fields are located within and at the back end of the movement yard as part of the recreation program provided at the facility. General housing is modular in organization, comprised of five housing modules plus an indoor recreation module. Each housing module is staffed with its own administration and counseling team that forms a core of offices and counseling rooms that subdivide the housing modules into two smaller living units. Each living unit provides cells for 64 beds on both the ground floor and mezzanine levels. Toilet, shower, laundry and storage facilities are located on both levels. At the center of each living unit is a two-story “day room” that conveys natural light to the cells and administrative offices from clerestory roof monitors. Day rooms are furnished with fixed tables and chairs with headsets for watching TV in a social setting. The recreation module provides indoor basketball courts, exercise rooms, multi-purpose activities, barber shop and mail delivery. The Support/Visitation services facility houses general classrooms, Vocational Education classrooms and shops, facility maintenance shops (operated by inmates), commercial laundry facilities (operated by inmates to serve the campus as well as off-campus institutions), the central plant that provides heat to the entire campus, three 3,000 SF dining rooms with 7,000 SF commercial kitchen, segregated housing, an infirmary, a medical clinic (with pharmacy), prisoner intake and transfer, prisoner visitation/multi-purpose and associated administrative offices. The prisoner visitation/multi-purpose space is 2,500 SF and has a 12-ft ceiling capable of supporting musical ensemble performances in a small audience setting.